Eligibility: Valid for travel agents or airline employees. ID might be required so take proof. Potential Savings: The savings vary but can be pushing 50%, though you’re unlikely to get that sort of saving for peak dates in New York! 20% might be more realistic there. Ease Of Use: Appears straightforward – this is new deal on Travel Industry Discounts so do please let us know of any issues in the comments. This is a new deal for us at Travel Industry Discounts and one we are excited by as it provides offers in one of the world’s great cities – New York. 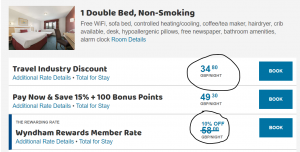 Of course, Wyndham and their hotel ranges including Ramada are global brands and so it is worth checking their offers wherever you might be going. However, where they really stand out in our opinion is in having offers in major US cities where travel industry savings are often hard to come by. 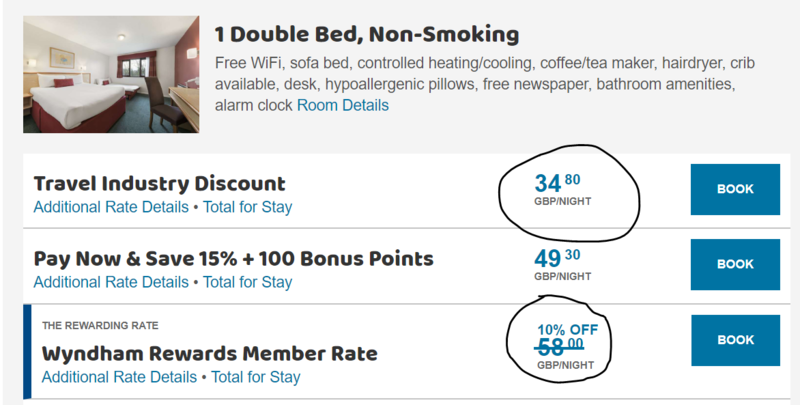 Wyndham also include a discount UK hotel range – Days Inn, in fact their full hotel list is extensive – full list below. And the beauty of the Wyndhams site is that it searches all their ranges. As an example, we just tried putting some dates in for Bristol and applying the code as detailed. We got a rate of around £34 a night, yet Wyndhams own reward club members would only get the same room £58! Potential Savings: The savings vary – 15 to 20% appears common but greater savings are available depending on the hotel and date.